The beautiful Constance Le Prince Maurice is a stunning romantic hideaway boasting lovely architectural design in a luxurious setting. Ideal for a gay honeymoon in Mauritius, the hotel is peaceful by day and set among lush tropical greenery. It has an incredible infinity pool whilst there is an inherent sense of tranquility. The Constance Le Prince Maurice is picturesque at night, whilst the structure of the hotel is enhanced by warm lights positioned to harmonise with the environment. Warm and luxurious, all Constance Le Prince Maurice’s Junior Suites are elegantly decorated in spice tones with a pinch of Mauritian warmth accompanied by ecological thatch roofing and welcoming flooring. Secluded and intimate the one of a kind Junior Suites on stilts are built on in a coastal lagoon filled with a unique mix of fish. Enjoy the incredible sea view each evening as you watch the sunset from your furnished balcony as a sense of peacefulness envelops you as you relax. Ideal if you’re travelling with kids. This spacious suite offers luxury and is designed to facilitate families. This luxury suite is set on the immaculate East Coast beach facing the ocean. The thatched roof and elegant decor are irresistible. Relax with a drink on your furnished terrace and take in the panoramic views. This elegant restaurant boasts wonderful views of the beach. Classic Mauritian cuisine is served with a range of other styles. There’s also an excellent wine cellar to choose from. Set on a lantern-lit pontoon, the waters of the barachois will be lapping around you as you tuck into a range of Indian Ocean flavours. Overlooking the pool and beach, The Laguna Bar is an ideal place to drink in the evening and enjoy a range of live entertainment. It’s also ideal if you like cocktails. This elegant bar is an ideal place to enjoy pre-dinner drinks. No tee-shirts or jeans allowed. 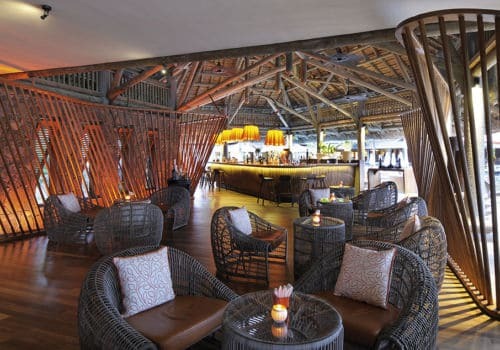 Set right on the Indian Ocean, you’ll be greeted with wonderful views as you sip an aperitif. With frangipani and tropical plants flanking the entrance to the spa, your entrance will be greeted by lush scents. Whether you’re looking for detox treatments, facials, massage or deep cleanse, your spa experience will be tailored to your needs. You’ll also have full access to the gym.